Terry Gross has the best job in the world. Just in the past couple of weeks she has interviewed Bill Hader, Ira Glass and Mike Birbiglia, and Chris Rock. Jealous! How do I get that gig? Hader is up for an Emmy, for Outstanding Supporting Actor in a Comedy Series. He is also about to begin his seventh season on SNL. I’m glad someone is sticking around! We were a big movie family — even more so than television and books. My grandparents lived next door to us when we were growing up — my mom’s parents — and they were the reading house, and our house was the movie house. And pretty much every night we would watch a movie, especially during the summer, and it was our way of relaxing. I will keep my fingers crossed since Hader is in a tough category. He’s up against Ed O’Neill, Jesse Tyler Ferguson, Ty Burrell, Eric Stonestreet, and Max Greenfield (Schmidt from New Girl). YAY! Mindy Kaling’s new show (formerly “It’s Messy”) has received a “series order” from FOX. I’m sad that she is leaving The Office, but I think she is getting off the Titanic and onto a 5 Star Cruiseliner. If you only know Mindy from The Office, you have to read her book! If you read her book, you will learn that her mother was an OBGYN. Inspiration for her character? I think so! 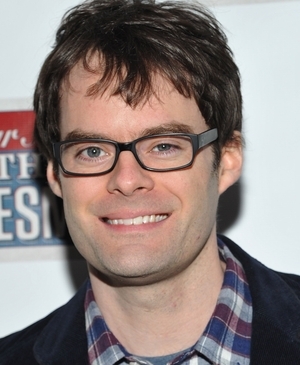 Also, Bill Hader! And Richard Schiff! And Ed Helms! I think they are only guesting for the pilot though. It was definitely a little weird to see Kelly and Andy on a date. Premiering in the fall (set to air on Tuesdays at 9:30 PM ET/PT), the show features Kaling as an obsessed-with-but-still-unlucky-in-love doctor, with some apparently self-destructive habits and pervasive insecurities. While the trailer does fly high on the powers of femininity, it’s not something that men won’t find entertaining. It doesn’t matter what gender you are, there’s nothing unfunny about Mindy Kaling backpedaling after inviting Ed Helms to sleep with her on the first date. 30Rock is going off the air, but I think The Mindy Project will be able to pick up slack in the laughs department (not the most attractive metaphor, oh well).